The entirely student-run journal puts out a yearly issue of student content. Since 2001, Stylus Journal of Art & Writing, a student-run creative journal, has been a feature of the University of Tulsa. Since its opening the goal of Stylus has been simple: to share the voices and original works of students. This year’s theme is Flux, which allows for a variety of different interpretations. 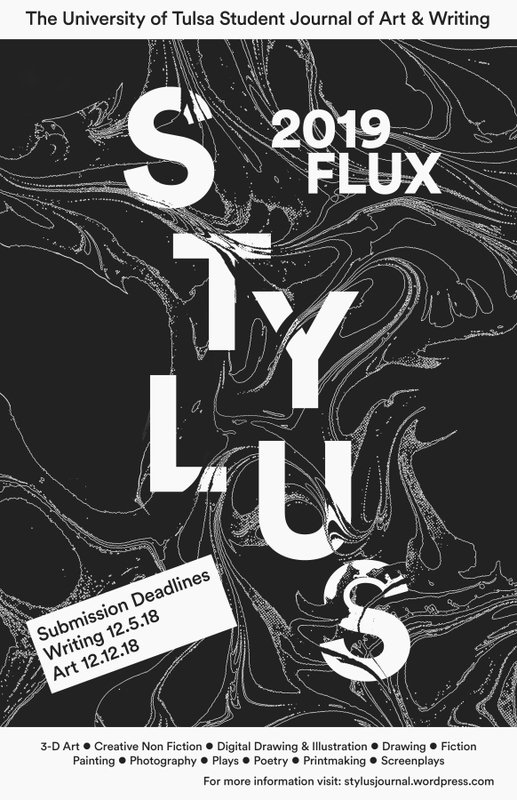 Stylus looks for works that take the theme of Flux in an unanticipated creative direction. Adherence to the theme is not required but is preferred. Writing submissions are open until Dec. 5 and must be sent digitally, while Visual Art entries can be submitted digitally or physically until Dec. 12. Each student may submit up to five works. Every editor considers the submissions anonymously and scores it from one to four. Writing works are scored on syntax, proper grammar and adherence to the theme when applicable. The quality of the work is considered as well when the editors discuss how much they enjoyed the piece. Before the second semester, the editors meet up, choose pieces and decide which to consider for an award. Stylus awards prize money to top submissions. $100 each is given to Best in Art and Best in Writing as well as $30 each for First Place in photography, painting, poetry, fiction and more. “As a senior editor this year, I chose editors that I knew can bring me a variety of things,” Veenker explained. Among the board this year are Senior Art and Design Editor Jay Newman and Assistant Writing Editors Emily Every, Emma Palmer, Brennen Gray, James Terrell and Thomas von Borstel. Each Assistant Writing Editor has a specialty, and this allows for a wide array of interests and artistic pursuits on the team. To join the editorial board, Veenker suggests submitting to Stylus first so the staff can be familiar with whoever is interested. Stylus is a chance for students to have a foothold in the creative world. It offers an opportunity to learn about the submission process and a built repertoire for prospects in literary journals. With his writing, Veenker looks inward in what he has experienced and how he can render that creatively. It is essential for him to make the mundane exciting. Everyone has lived through the mundane — and an emotion like grief may be generic — but it is the relatability of experience that connects the writer to their audience. For an artistic point to stick with the writing editor, writers should ensure their piece does not have distracting grammar errors. Legibility can easily bury a good piece, and problems with grammar may warrant a lower rating of a work. Stylus is a chance for students to express themselves and have their voices debuted in a creative journal. With a student-led journal, there is a sense of camaraderie. The editors know how hard it is for an undergraduate student to be published, and they want to showcase the work of all students, regardless of field of study. More information on Stylus can be found on their website, stylusjournal.wordpress.com, or on their Facebook and Twitter accounts.